An hour to spare and a fresh cup of tea waiting to be drunk? What better than a chin-wag with Mary, the doyen of the switchboard operators? Bristow made friends with her very early on. Perhaps his motives were a little cynical since she is one of the prime sources of information in the Company. Strip 4365 was published in the Evening Standard in April 1975. Another less honourable motive for his interest is in using her talents as a knitter (to make a little hood for his feathered friend). Supervisor : Mary were you in the habit of allowing staff to make personal calls? 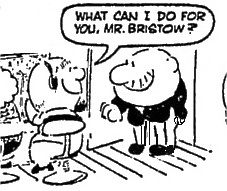 The new policy is rather embarrassing for Bristow.